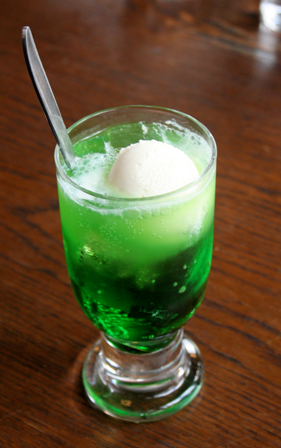 June 20 is not only the official first day of summer—it’s also National Ice Cream Soda Day! We can’t think of a better way to celebrate the beginning of the season than with a cold scoop of vanilla ice cream slowly melting into a glass of root beer, Sprite, Coke, or something more exotic. As with many distinctive American food inventions, this tasty treat began as an accident. Cream soda was quite a popular drink served in drugstores during the second half of the 19th century. One “soda jerk,” Robert Green, found himself short on cream on a hot afternoon, and rather than give up business from thirsty customers, he decided to use a little ice cream instead. As you can imagine, people loved the flavor and couldn’t get enough of it. Today, most people are familiar with the root beer float, but you can find ice cream aficionados all over the world who swear by different delicious combinations. Orange soda and vanilla ice cream—tastes like a special kind of sherbet. Coca-Cola and chocolate have a special connection in many peoples’ minds, and grape soda with vanilla ice cream even has its own official title: the Purple Cow. In fact, the nicknames for the many ice cream soda possibilities start to sound as complex as those in the world of mixed drinks! You can order a Snow White (vanilla and 7-Up or Sprite) or a Butterbeer (root beer and butterscotch ice cream), and if you’re a real ice cream expert you’ll call a root beer float a Black Cow. If you want to get technical, a scoop of ice cream in a soft drink is referred to as a “float.” To be called a “soda,” it should really be a mixture of soda water, ice cream, and flavoring syrup. But usually the dessert disappears too quickly for people to argue about exactly what to call it. To celebrate National Ice Cream Soda Day, we suggest you use our basic ice cream soda/float recipe and customize it according to your unique tastes (and whatever you have in the house at the moment!). Obviously, ice cream with nuts or chips doesn’t work too well, but fruit flavors go very well with different kinds of soft drinks. Invent your family’s very own soda and give it a name that will catch on. You might have the next big thing in desserts!